Clifton Packaging Group is one of the UK’s fastest-growing companies in the field of flexible packaging. The investment in a third flexo printing press from KBA-Flexotecnica now represents the continuation of the successful partnership between the two companies. “We are very satisfied with our two existing flexo presses. Service, quality and further technological advances convinced us once again that we can continue to grow with Koenig & Bauer technology. With the high level of performance seen so far, and based on a close working partnership forged over many years, Clifton Packaging were happy to once again work with KBA Flexotecnica,” says managing director Shahid Sheikh OBE. “Furthermore, Clifton Packaging see the synergies that the wider Koenig & Bauer Group can offer to flexible packaging markets, and we look forward to seeing new developments and new solutions from Koenig & Bauer”. 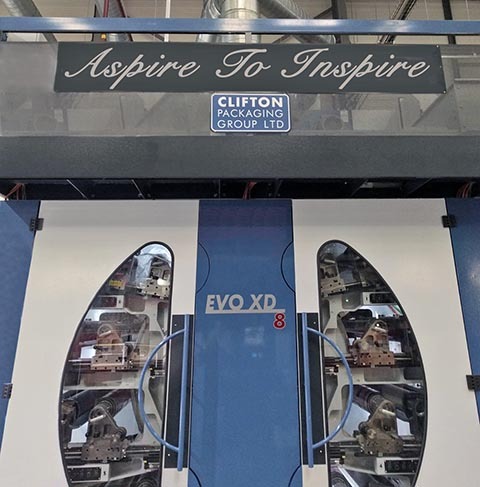 The new Evo XD from Koenig & Bauer was fired up in Leicester, England in early 2018 and will primarily print flexible packaging. Clifton Packaging was founded in 1981 and has since established an excellent reputation and brand for itself especially when it comes to innovation. In recent years Clifton has grown considerably which resulted in the company being recognised by the London Stock Exchange as one of the top 1000 most aspiring and fastest growing companies in the UK. The company specialises in high-quality packaging for FMCG markets and the Wet Protein sector. These products are sold throughout the world, including Africa and the Middle East. Thanks to its very broad portfolio of materials and packaging options, the company can react quickly to customer requirements. However, Clifton Packaging not only regards itself as an innovative packaging printer, it also offers its customers a complete packaging solution, from the idea to the finished product. Furthermore, the Clifton group not only prints packaging and supplies pouches, it also offers contract packing services and sells food processing and packing machinery including multihead weighers and ancillary equipment. It is believed to be the only company of its type in the UK to offer the full packaging solution. With its eight printing units, a new dryer generation and newly developed drive and control technology, the cutting-edge Evo XD is tailored to meet high quality requirements on a wide range of substrates. The CI flexo press has a web width of 1,320 mm and a cut-off of 370 to 1,000 mm. The technical highlights include a highly efficient energy-saving ventilation system in the bridge dryer and the fully automatic AIF impression setting system, which needs no ink during the adjustment process. The user-friendly ARF register setting system ensures that start-up waste is reduced to a minimum. All of the important automation and control functions are integrated in the new touch screen panel, assuring intuitive press operation. As far as automation for fast job changes is concerned, the Evo XD is state of the art. The press can run at speeds of up to 500 m per min depending on substrate.